I arrived at the store and after chatting for a brief moment, we went right out to the vehicle. Exterior styling is superb– classic Porsche-esque, but nonetheless, distinctive from last year’s model. The doors are now unique from the other Porsche models, boasting a distinctive character line– something a Porsche aficionado would definitely notice. There are 5 wheel options, including the 20’s that this S boasted. Yes, I like my big wheels. We jumped in the vehicle, and Faris pulled it out of the lot and drove a few miles before we switched seats, so I got a chance to really take in the vehicle and experience the ride as a passenger, (which was comfortable and smooth), before focusing on the thrill of the powertrain first-hand. High-quality materials adorn the interior space, and clearly attention was paid to even the smallest details. Being the fashionista that I am, I noticed the fine leather and even the stitching. The center console is elevated, and for those of you lacking in NBA-caliber stature like me, this was [ergonomically] pleasing. I could reach everything without feeling like I was going to pull a muscle in the process, or overall exerting too much effort. And for those of you that are a bit taller, an extra inch was added to move the seat back for your comfort, probably made possible since the wheelbase was increased by 2.36 inches. We aim to please. Falling in the mid-engine range of Porsche’s model line-up, the new Boxster S boasts 315 hp and 266 lb.-ft of torque at 6700 rpms for both the 6-speed manual transmission and PDK versions. 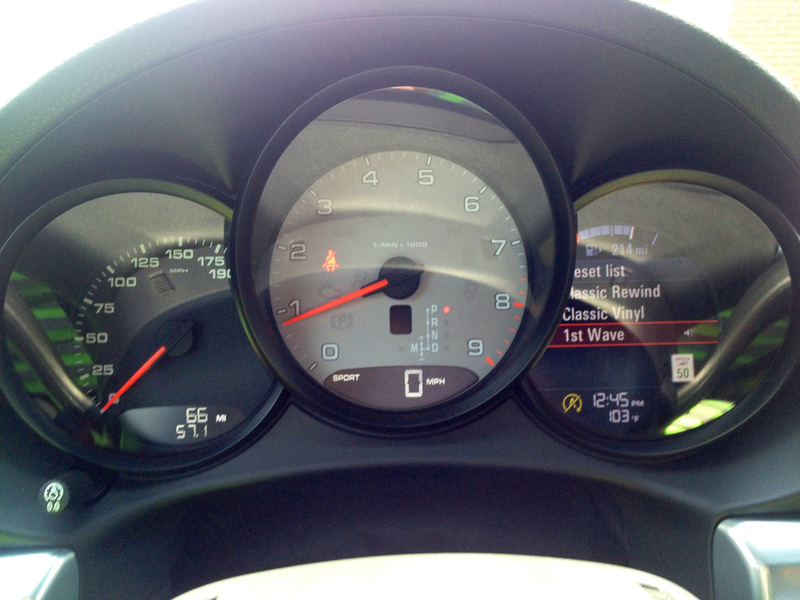 (The Boxster produces 265 hp and 206 lb.-ft of torque.) With the S getting from 0-60 in 4.8 seconds with the manual, and 4.7 seconds with the PDK, (Boxster does in 5.5 seconds with the manual and 5.2 with the PDK version), there’s no denying this is a serious vehicle, though personally, I didn’t get to try this on the regular streets– maybe next time…on a track. What is PDK? It stands for Porsche Doppelkupplung and it’s their true dual-clutch, 7-speed automatic transmission, essentially giving you the benefit of the manual transmission with the ease of an automatic. It uses two separate clutches, for the odd and even gears respectively, but functions as one unit. It operates in automatic mode, but also gives the driver the ability to shift manually, if they so choose. To be perfectly honest, I was leery about driving an automatic model, as a true “car girl,” I want to switch my own gears, and basically, I want to be in control. Most females do, right? However, I have to admit, my expectations were clearly surpassed. 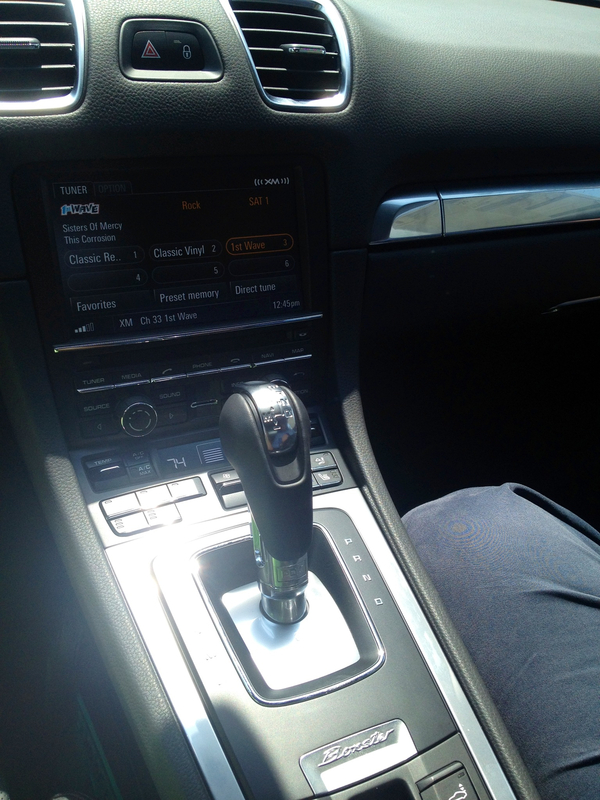 The sportiness and fun-to-drive aspect were all there– even without using the paddles I didn’t feel like I sacrificed anything by driving the PDK. We took a route that was full of winding roads that allowed me to really feel how the vehicle handled going in and out of corners (at various speeds), and how quickly it shifted with my maneuvers. The cornering also reflected the precise steering, (as a result of my driving skills, of course,) but also with the help of PTV (Porsche Torque Vectoring), which transfers torque from the inside to the outside tires to help with stability. There’s been some hype about the electric motor-assisted steering, but in my opinion, I found that the road feedback was still there. Plus, the system is not always active- it merely kicks in when necessary, and furthermore, it requires less work and saves weight, thereby improving fuel efficiency. One thing that did take a bit of getting used to was the automatic start-stop function. It helps with the [amazing] fuel economy numbers– 30 mpg!! However, I’ll have to admit, when I came to my first stop, it was so quiet that I worried for a split second that the vehicle had stalled, albeit we were in the PDK automatic. Ahhh, technology. Wonderful and useful in so many ways, yet the bane of my existence. So what about the PCM (Porsche Communication Management)? Well I found it intuitive and very easy to use. I may be a bit of a “techy” myself, however, I found that it was simple enough that someone like my father would grasp how to use it. The mastermind of the system is the 7-inch, hi-res, touchscreen, coupled with a few conventional buttons (which seem to be disappearing in vehicles). New for this year’s model is the hi-res 4.6 inch screen on the right side of the instrument cluster, which allows you to control functions such as the navigation, audio system and vehicle settings with a toggle switch on the steering wheel. I found this uber convenient, as it keeps your hands on the wheel, and your eyes forward, rather than engaging your peripheral vision to look at the center stack. Yes, music is my mantra, (especially with all of the driving I do), so the audio system is crucial in my evaluation process. I’m delighted to say that the S was equipped with the BOSE Surround Sound System (not standard, but an available option), and it didn’t disappoint, even with the top down. I feel like sometimes with convertibles, you have to blast the sound system to an ungodly [disruptive] level in order to hear your music, which either distorts the sound quality or leaves you with a headache. This did neither– loud or soft, top up or down, the sound quality was exceptional. With the temperature gauge reading 103 degrees, and feeling the sweat accumulate on my back even with the ventilated seats, the top didn’t stay down for long. I’ll admit, I didn’t want to feel like those silly people that keep their windows up, blast the heat–or AC for that matter, only to keep their top down. A bit illogical if you ask me. As for the trunk space, well let’s be realistic– you’re not buying a Porsche for the cargo room, (or if you are, you may want to opt for the Cayenne.) However, for those of you golf fanatics, a full set of clubs does fit in the rear– tried and tested. Oh yeah, or you could always opt for the front seat. And no, I’m not a connoisseur, but a novice-in-training at best. Somehow I often find that Porsches and golf go hand-in-hand. Just a reminder you, do get both front and rear trunk space, and for those opting for the convertible, when the top is lowered it doesn’t hinder the space as it sits on top of the engine bay. Porsche claims that “braking performance is as essential as driving performance.” And if you’re a car guy/gal, or simply concerned about safety, you’d agree. Both the Boxster and the S models are equipped with four-piston aluminum monobloc fixed calipers at the front and rear. Discs are internally vented and the diameter of the front discs on the S have increased by .59 inches. 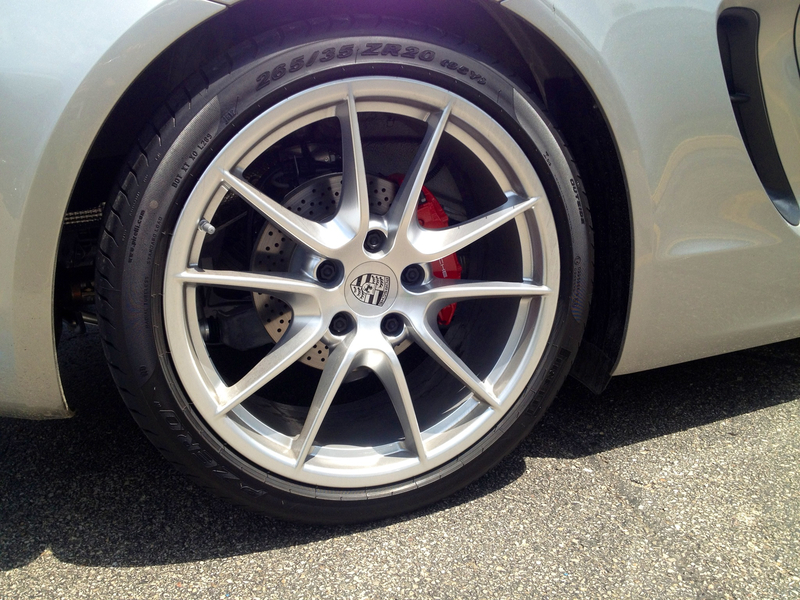 Larger brake pads and a new brake booster improve braking and component stability. For those of you looking to quickly distinguish the two models (other than looking at the blatant “S” on the rear,) calipers on the Boxster are black, while those found on the S are red. For performance-minded drivers, an optional PCCB, (Porsche Ceramic Composite Brake,) is available, which enables shorter braking distances in the toughest road and/or racing conditions. Its extremely low weight helps to increase performance and fuel efficiency simultaneously. Another interesting fact, as pointed out by my friend, Faris Nijim, is that the e-brake is now electric, saving a whopping 26 lbs than the former [traditional] e-brake. Porsche Stability Management (PSM), is standard, and it includes sensors that monitor speed, yaw velocity, and lateral acceleration of the vehicle. Utilizing this information, the PSM applies the brakes to individual wheels to maintain or restore stability of the overall vehicle. Specifically on wet or low grip surfaces, PSM helps to improve traction. I can attest to this as during my test drive, I “accidentally” encountered major road construction, (inevitable in the city of Chicago.) I can’t believe I’m saying this, but it actually ended up being positive, for-the-first-time-ever, as I got to first-hand experience the system in action. (Much more effective in validating the functionality, than just hearing about it.) If you really want the sporty drive, you can turn the PSM off, but given I wasn’t on a track and had real-life obstacle like the CPD to worry about, I left it on. Additionally important safety features to note are the engine drag torque control (EDC), pre-charging of the brake system, and brake assist. And no, for those of you control freaks out there, calm down, it doesn’t stop the car for you. Key word: assist. Basically the brake pads are placed on the discs when the system detects a “panicked” braking situation, thereby increasing brake power and maximizing deceleration quickly and effectively, when the need arises. If you’re impatient, I’m sorry to say, but there’s a four month waiting list for the new Boxster, with a base price of $49,500, and dealers like the Porsche Exchange won’t be seeing more vehicles in their showroom until August (and October for the S, which starts at $60,900.) But hec, they say the best things in life are worth waiting for, right? For those of you that haven’t read my previous post on the GT2 RS launch at the Porsche Exchange, I must add that this store is the number ONE Porsche dealer in the Midwest, and ranks amongst the top in the nation. 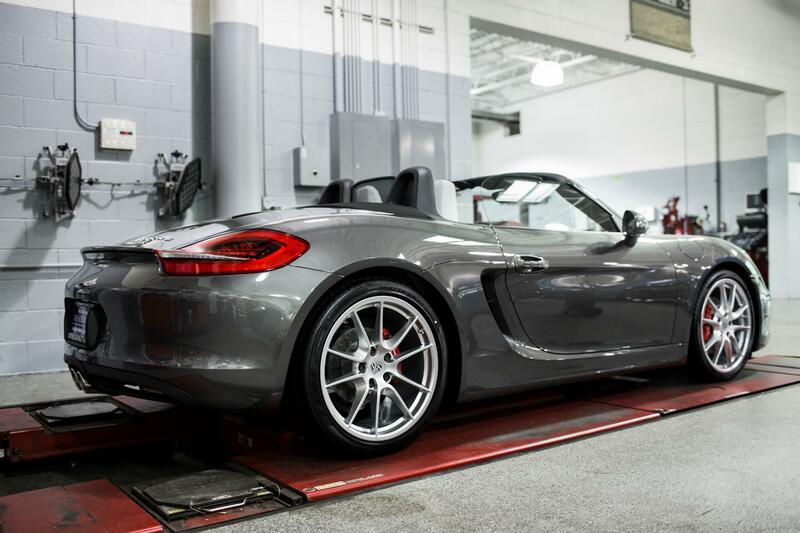 Their motto is “you will be treated as we would like to be treated,” and it’s clearly evident from their sales performance, customer loyalty, and numerous accolades, classifying them as a “premium” Porsche dealer. This entry was posted on July 9, 2012 at 3:40 am	and is filed under Car News & Trends, CarsDiva: Fast & Furious. 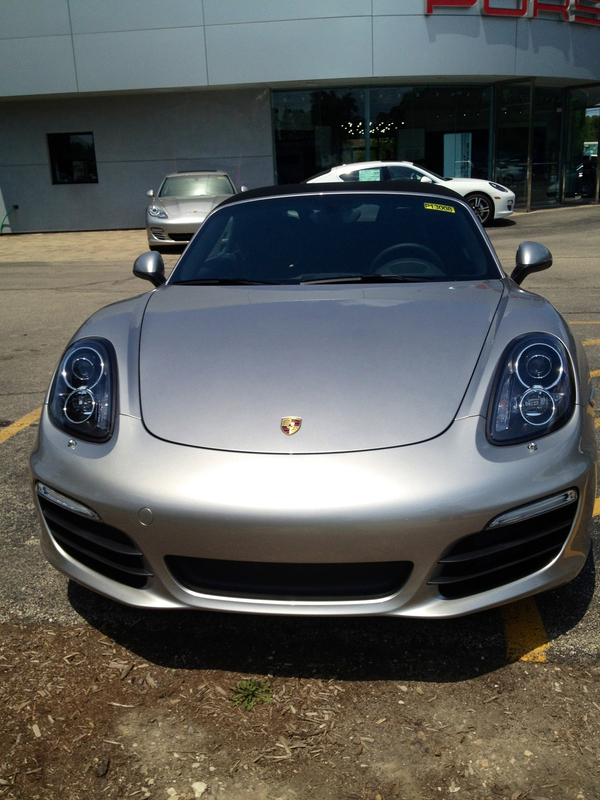 Tagged: 2013 Porsche Boxster, 2013 Porsche Boxster S, luxury cars, Porsche Exchange, sports cars, The Exchange Auto Group. You can follow any responses to this entry through the RSS 2.0 feed. You can leave a response, or trackback from your own site. How are you. My major concern was getting a set of golf clubs in the rear trunck. Did you have to remove the clubs from the bag? Thanks for your help please let me know. The car looks great. So if you were buying the Boxter would you go for the PDK or the manual? I have been leaning towards the manual as I enjoy the driving experience, but all the 2013’s I have driven have come with PDK. Thoughts? As I mentioned above, I was impressed by the PDK and it definitely exceeded my expectations. That being said, my personal preference would be manual. Honestly, I just like always having control, in addition to the “driving experience.” What did you think when you drove the Boxster with the PDK? My main concern was for the resale. will people be buying manual shifting for much longer here in the US? Does it matter for this car as people looking to buy one presumably know driving and would be able to drive stick? I would agree, manual vehicles are less prevalent. However, you’re correct– those who are driving this type of vehicle are [typically] more concerned about the performance as opposed to other features. At the end of the day, I don’t think you can go wrong with either manual or PDK, but it’s about what’s most important to you. After all, you’re the one that will be driving the vehicle every day…. What’s up, just wanted to tell you, I liked this blog post. It was practical. Keep on posting!